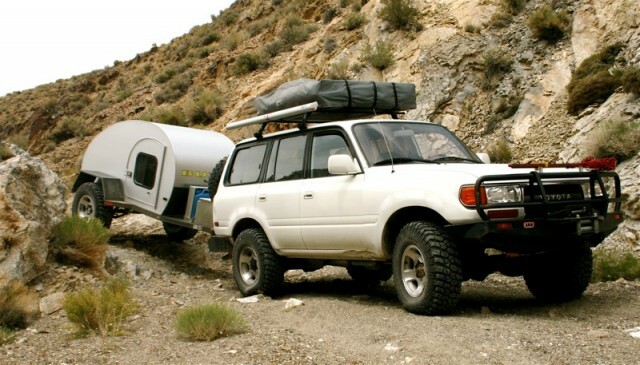 Looking to get into an off-highway camping or utility trailer, but faced with a tight budget? For many folks welding up a home-built trailer from scratch is the answer. 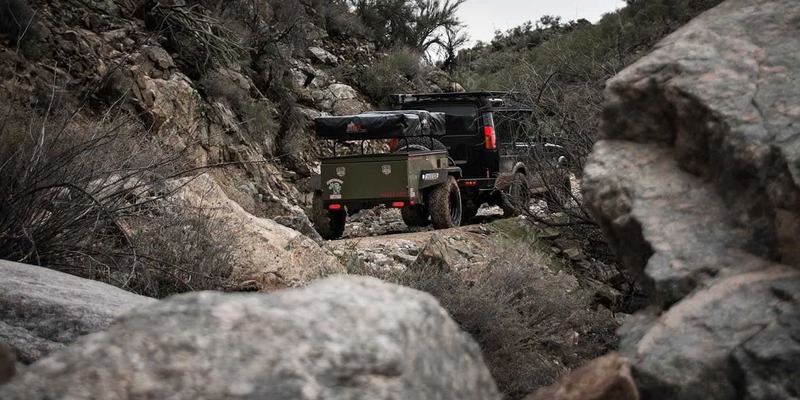 But for those of us who lack the necessary skills, tools, or a decent workspace here’s a list all-terrain trailers that can get you fully outfitted and on the road for under $10,000. Note: this list will be updated as we become aware of more options. If we have missed something please leave a comment and let us know! Thank you and enjoy the list! Dinoot is a relatively new player to the game but certainly makes cost their big consideration. For simplicity we’ve decided not to list each individual model and option as pricing can vary widely depending on how you choose to build your trailer. What we can tell you is buying the tub alone can be as affordable as $785 to $890 depending on the model, with DIY frame kits or plans available to drop off at your local welding shop. We have yet to get our hands on a test model, but customer feedback looks promising for this DIY kit. Find out more on their website here. 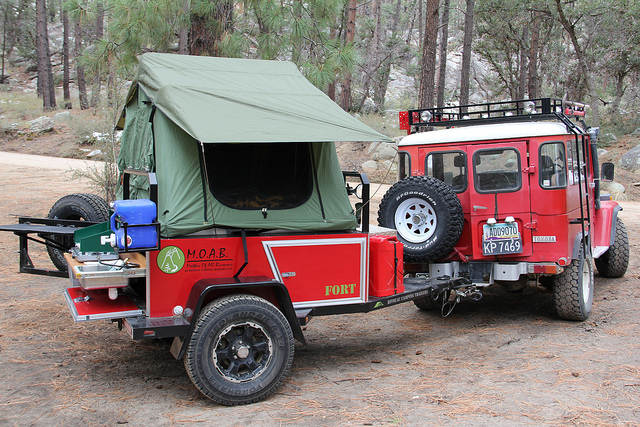 Package “C” comes fully equipped for $8,495 with 30″ all-terrain tires, cargo rack, Tepui Kukenam tent, sliding rear galley with two burner stove, water basin with drain, basin water bottle, swing-out tire carrier with dual folding food prep counters, fuel can, and a mounted shovel & axe. Details on the BCT website. For just under $6,000, the Cascadia Explorer includes an independent suspension, stabilizer jacks, onboard battery, water tank and pump, stove, and even the kitchen sink. 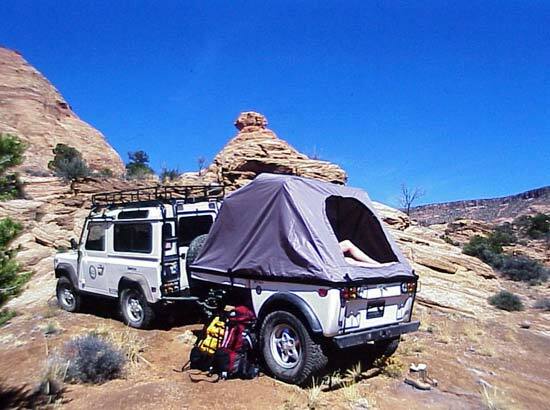 Just add a tent and your gear and hit the road. For more information visit CVT. 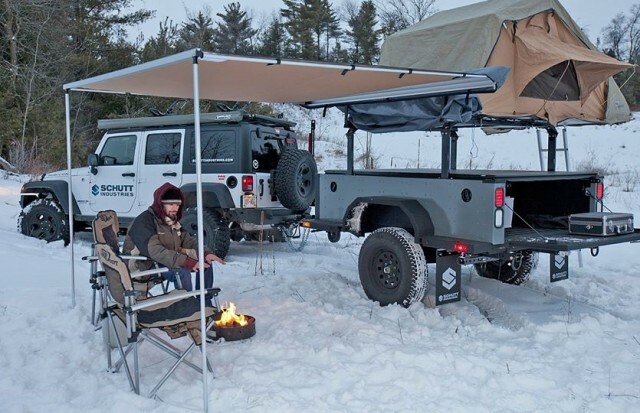 The Basecamp comes standard with 33″ all-terrain tires, multi-axis coupler, and a large work table for cooking. 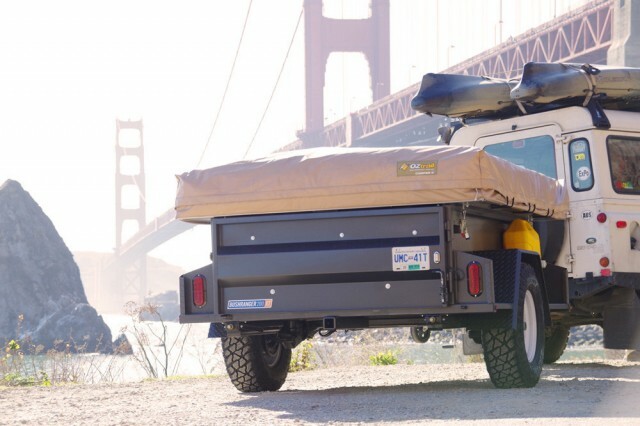 The cargo box features three doors (one on each side, one in the rear) and a hinged lid for easy gear access. Pricing starts around $6,500 plus options. 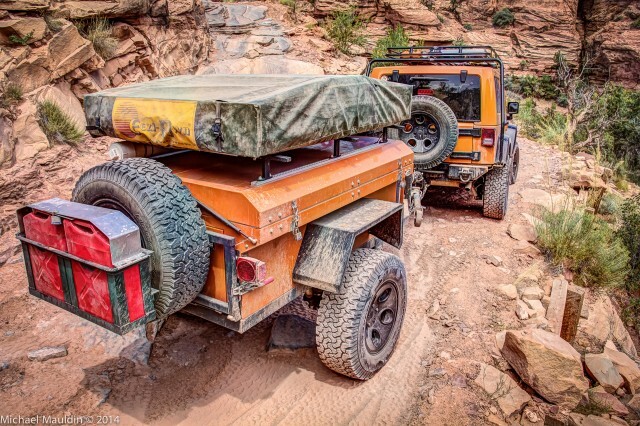 More info on the Basecamp is available at Jackwagon Off-Road. 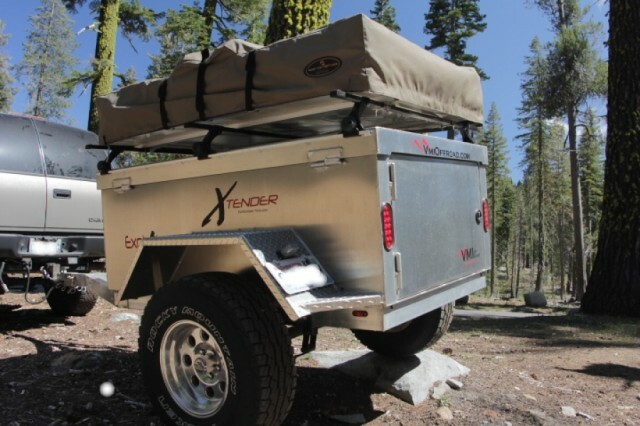 Xventure has been better known for their quality construction and downright luxurious setups, but recently they have released two trailers coming in at the under 10k mark. 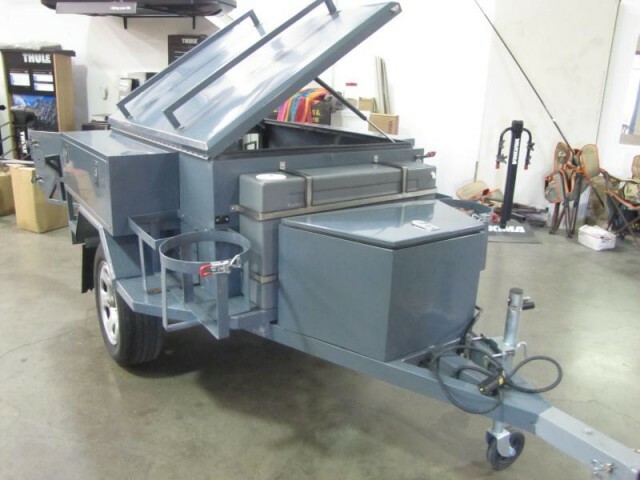 The XV-1 which is a base model trailer with a tongue box and removable tailgate, independent suspension, electric brakes, and standard tie downs, starts at $6995. The XV-1A, which includes all of the previously mentioned items plus an ARB roof top tent, ARB annex with room extension, ARB 8′ awning, and a painted tub comes in at $9995. Check them out on their website here. 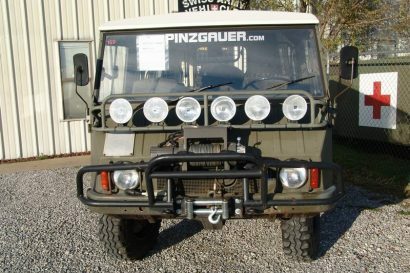 The “XT” package upgrades the BushRanger 200 with everything it needs for trail duty, including 29″ all-terrain tires on 15-inch wheels, TorFlex® independent suspension (Timbren Axle-less optional…and recommended), side steps and beefier fenders, a heavy duty extended draw bar, and an optional MAX Coupler. 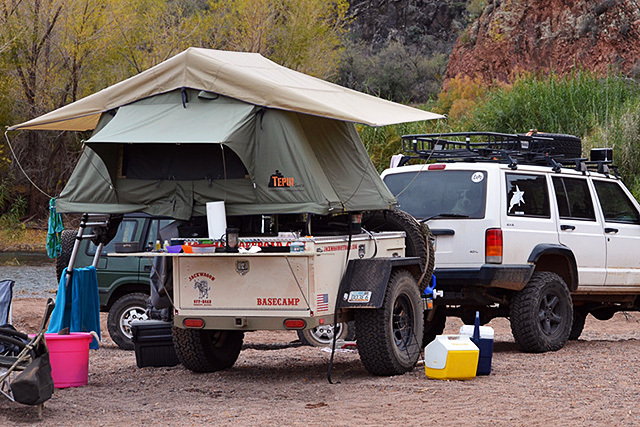 The BushRanger’s centerpiece is the massive OzTrail Ridgeline Zenith, one of the most comfortable and convenient trailer tents on the market. No fridge, stove, or galley are included, but with a base price under $6,000 there’s still plenty of room in the budget to add them. Visit Kakadu Camping for details. Manley’s “Utility” model adds 31″ all-terrain tires, recovery hook, trailer rack, bed mat, and a soft tonneau cover to keep your gear clean and dry, with prices starting at $6,495. Visit Manley ORV for details and options. Ruger’s 5- and 6-foot models start at $3,995 ($4,895 for the 6-foot) and feature standard 31″ tires (33″ on the 6-foot), recovery points, and cargo tie-downs. Visit Ruger Offroad Trailers for complete specs and options. A great option for smaller vehicles like 2-door Jeeps and Samurais, the A/T Off Road version of the Tentrax trailer can be picked up well outfitted and ready to hit the trail for under $6,000. See Tentrax for complete pricing and options. 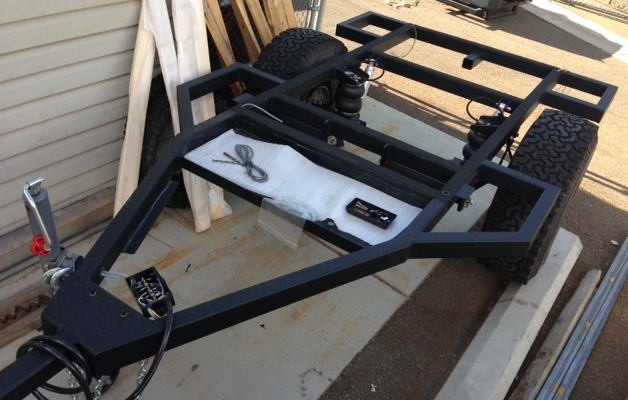 If you’re a handy DIY’er but simply lack the space or tools to build a trailer completely from scratch, AT’s new DIY Chassis could be the answer. Three different sizes of complete rolling chassis are available starting around $3,500, leaving you plenty of budget to customize to your heart’s content. 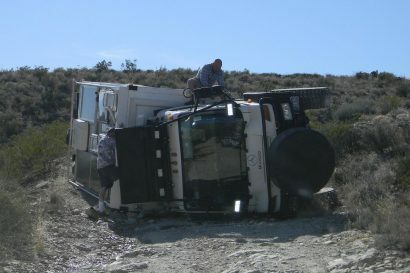 Visit AT Overland or call 877-661-8097 for details. 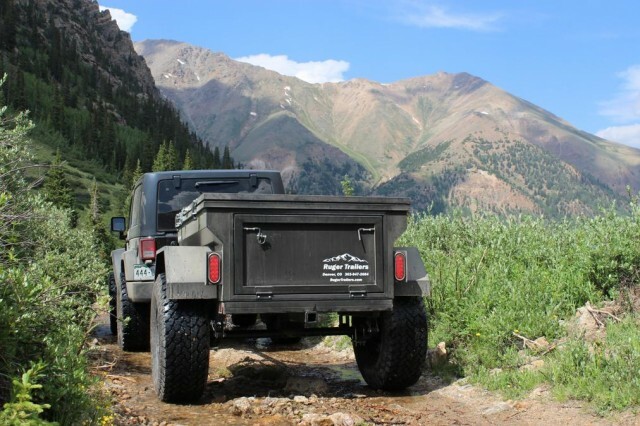 The AT Chaser trailer is reminiscent of the classic lines of the military 416 & 101 trailers, but with modernized suspension and high quality craftsmanship. Options abound and with a quick glance you’ll realize that boosting your out the door price to the high teens is an easy task if you’re not careful. A base price of $7,672 buys you the following. This sturdy, compact ligthweight (only 600 pounds) starts just under $7,000, a great deal considering its all aluminum construction. VMI offers a long list of factory options and upgrades for matching the Explorer to your needs. Visit VMI Off Road for details. 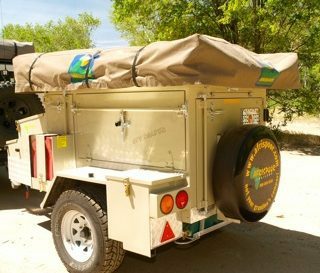 While not your traditional style of off-road trailer, the teardrop offers some distinct advantages including hard walls, insulation, and easy setup and breakdown of camp. While just making it into our under 10k category, the Buzz-Off comes equipped at $9,535 with heavy duty Old Man Emu leaf springs, sprung under a 3500 lb axle with 10″ electric brakes and 9-way adjustable Rancho RS9000XL. The cabin is outfitted with a single curb side door, cabin light, 12v outlet, cubbies and flip down shelves. Sadly the Buzz-Off doesn’t include a rear hatch or galley but the fenders are wide to accommodate cooking.